I thought about arriving on a motorbike, but since I bought a new car I can not wear it for a while. It is pretty good product, first though I thought about buying purity but because the price is expensive, I ordered from our company. This review is about item#36683491. The feeling of wisteria is a good feeling. It seems to be larger in size than a normal basket a little. Picture is too good. I regret that I thought that it was more rattanish. But as a product there is firm strength as well and there are also large and high, so you can put items such as shopping with confidence. This review is about item#36683507. It was a product knitted with vinyl strings on the main point of the wire. Because it was written as "Rattan style", I expected that it was more realistic, but the impression that I received is "Vinyl basket". It was a feeling that the photos were too good. It does not matter for use, so it will be good because it is likely to last long. I have been working for more than 4 years since purchase, but I am doing my best at active duty. It used for 5 years, installed in Super Cub, but durability is outstanding and still active. 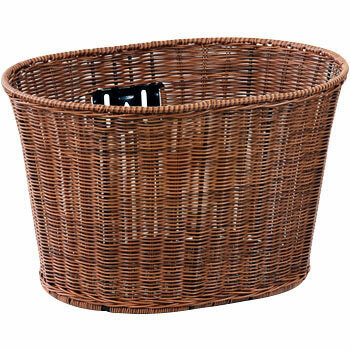 The strength of the basket itself is also excellent, without discoloration of wisteria style. I purchased it again for my bicycle. I am satisfied with the design, I am very satisfied if it is about a little higher (5 cm) if possible. I installed it on a 20-inch bicycle. It is good to wash durability well with rattan style. Because it looks like a resin tube rather than a rattan it is knitted so it will be okay if it gets wet in the rain, it will be okay too dry and it will not break and it will be good I think that it looks like a rattan better than anything and it is a favorite because it looks like a good thing. I'm glad that there are also rear baskets.